fever is an increasing of body temperature above normal under the influence of thermo regulatory center. Abnormal elevation of temperature. The normal temperature taken orally ranges from about 97.6° to 99.6°F, although there is some individual variation. Rectal temperature is 0.5° to 1.0°F higher than oral temperature. Elevated temperatures that are caused by inadequate thermoregulatory responses during exercise in very hot weather is called hyperthermia; the set point is not increased. Fever involves resetting the temperature set point that the body seeks to maintain at a higher level. and tumor necrosis factor from white blood cells, esp. macrophages, secretion of acute phase proteins, and redistribution of the blood away from the skin by the autonomic nervous system. in fever there is increase in body temperature along with hypothalamic thermo regulatory set point. uncontrolled rise in body temperature but unchanged thermo regulatory set point. 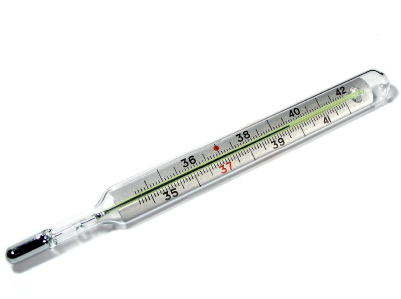 fever of more then– 41C (106.7F) is called hyperpyrexia. causes are—infection, CNS haemorrhage, etc. hyperthermia dose not respond to aspirin and paracetamol. hyperpyrexia and fever both respond to paracetamole and aspirin. some time by anaesthetics, succnyl choline. the failure of thermoregulatory mechanism in body can cause the heat stoke. it may be exortional or non exortional. there is continuous fever with the fluctuation of only 1F . temperature never touch normal. there is persistent fever but the fluctuation is more then 1F. the temperature of body comes to normal during the certain time of day. it is intermittent fever but it occurs daily. fever occurs 1st day and then 3rd day. fever ocure 1st day then 4th day. fever 3- 10 day then no fever next 3- 10 day, like in Hodgkin’s lymphoma. the fever occur every 21 day. the best anti pyretic is paracetamol that can be used. IV fluid, gastric and peritoneal lavages with iced saline, haemodialysis, etc.